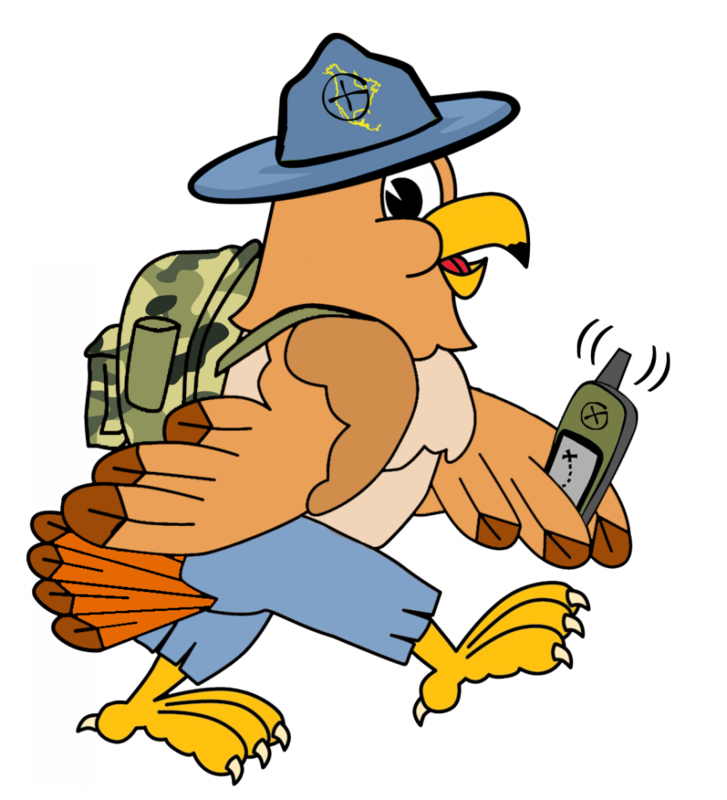 Not to be outdone by green Frogs with antennae on their head, or blue Squirrels that don’t really look too much like Squirrels, OpenCaching North America is ringing in 2015 by introducing our new mascot; Hank the Hawk! The idea for him, believe it or not, was born out of a thread in our forums started by a cacher who couldn’t find their own cache listings on our site. We quickly figured out he was confusing us with Garmin’s Opencaching.com, a rather common mistake. He commented how the site looked a little different then he remembered, and there was no “little blue mascot guy thingy”. 🙂 We then started our own thread in our own sub forum visible only to our admins and volunteers, and the idea for Hank was born. Hank is a red-tailed Hawk, by the way. For more on why he is a red-tailed Hawk, why he’s named Hank, and who made him, as well as some other things OCNA has planned for 2015, click the read more button below. Why is he a red-tailed Hawk? The idea for the red-tailed Hawk came from OCNA Admin DudleyGrunt. He said “We could make him a Red-Tailed Hawk, since they are an exclusive to North American bird, and the most common Hawk in North America”. There is a “distribution” map if you follow that link, and you can see the red-tailed Hawk is found throughout North America (Canada, The U.S. and Mexico). That’s our OCNA territory, and all the OCNA admins quickly agreed the red-tailed Hawk would make an excellent mascot. Why is he named Hank? 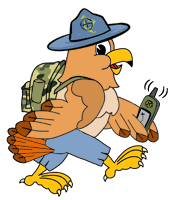 Hank was designed (with lots of input from the OCNA admins) by Nancy of The Deadliest Cachers, a Geocacher from Derby, New York. Her cache page graphics are sort of legendary in Western New York. She has also designed several Pathtags for fellow Geocachers. Feel free to contact her via her profile on Geocaching.com, as linked above, if you’re interested. 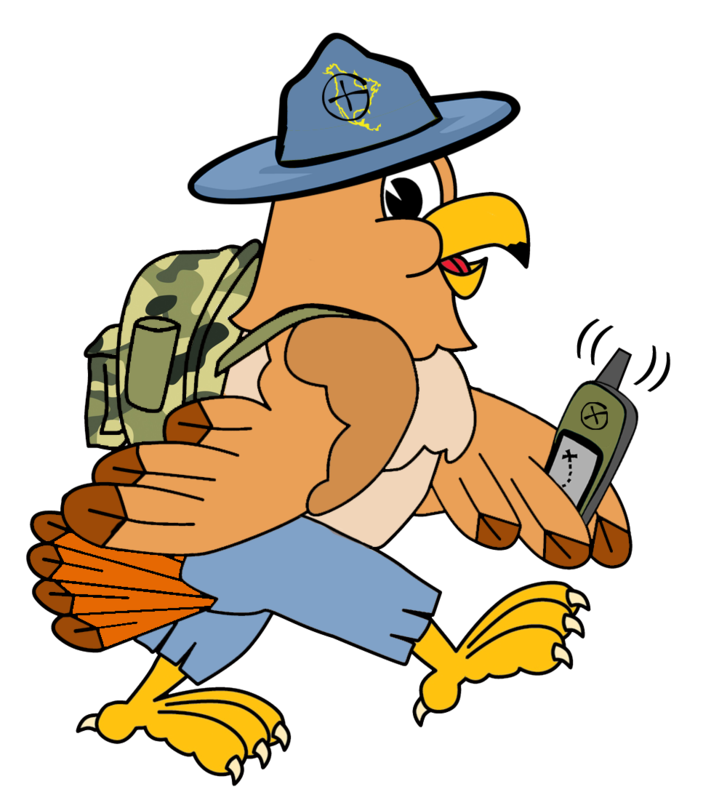 The basic Hawk is a stock image, but he has been significantly altered. Unlike copywrited Frogs and Squirrels, we plan on creating a creative commons license, and releasing Hank into the public domain. Look for that in the downloads section of our Wiki in the near future. What else does OCNA have planned for 2015? Thanks for asking! First is Locationless Challenge Caches. With only about 1,400 active caches in North America, we realize any physical challenge caches would not get very much traffic, even in our so-called “hotbeds of activity”. So inspired by Cyber Caches on Terracaching.com, and a handful of locationless challenges created by a European cacher on gpsgames.org, we’ve decided we are going to create some ourselves. These will be owned by an OCNA admin account, and will be Geo-Art, most likely in the Atlantic Ocean. If you qualify, you can log them. Have you found 25 caches on OCNA? Have you found OCNA caches in 5 different States or Canadian Provinces? Then you get to log the cache. The possibilities are endless, as they are with Challenge Caches on Geocaching.com. We plan on coming up with dozens of them, and we promise most of them won’t be all crazy and unattainable by the average user of our site. On the heels of our moderately successful “Diversified Cacher Contest” which ran the entire month of August 2014, we plan on running another contest in 2015. Look for this one to be more OCNA specific though, as opposed to the last contest, which was geared not only towards us, but fellow alternative Geocaching websites, as well as other GPS games and GPS enabled smartphone app games (i.e Munzee, Sighter and Monster Cache, for example). Stay tuned, you’ll hear about it all here first! Also, hawks have a varied diet that includes both frogs and squirrels.